Aprende a surfear con hasta tres amigos. Practica surfear movimientos en la arena antes de golpear el agua. Elige entre las clases durante todo el día. Incluye el uso de tablas de surf y protector contra salpullidos, y un instructor experto. We highly recommend this surfing. We got a great and knowledgeable instructor. It was a good review before we got into the water. Great tour!! There was a 30 minute lesson on land before my daughters went out in the water. They enjoyed it and there was someone that took pictures while they were out in the ocean. Great experience! 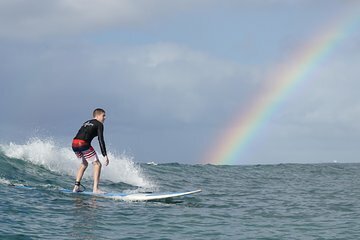 Our instructor was extremely personable and knowledgeable about surfing and Hawaii in general. We had a great time and learned a lot. He took us to a semi-secluded surfing spot, away from the main beach, where we could learn and enjoy 15-20 second rides. It was fantastic, would definitely book again. Had a great time - Our guide to surfing was smart helpful very pleasant, and always positive and encouraging - Loved it !!! I will do this again !! My instructor Caz he was informative and worked very hard! I was able to stand up on the board by the end!